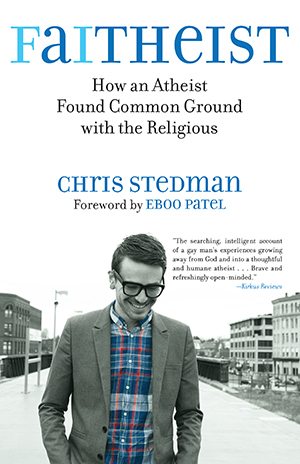 In Faitheist, Chris Stedman makes a passionate argument that atheists should engage religious diversity respectfully. Becoming aware of injustice, and craving community, Stedman became a “born-again” Christian only to encounter staunch homophobia at a time when he was slowly coming to realize that he was gay. The great suffering he experienced might have turned Stedman into a lifelong “New Atheist.” But over time he came to know more open-minded Christians and found that his disdain and hostility toward religion was holding him back from engaging in meaningful work with people of faith. And it was keeping him from full relationships with them-the kinds of relationships that break down intolerance and improve the world. As someone who has stood on both sides of the divide, Stedman is uniquely positioned to present a way for atheists and the religious to find common ground and work together to make this world-the one world we can all agree on-a better place. The next day, I attended my weekly religion class at Loyola University’s Institute of Pastoral Studies, a Jesuit Catholic¬±run program for priests, nuns, and lay leaders. As the only self-identified nonreligious person in the class, I was regularly met with many questions. Once, a Catholic classmate cornered me in the elevator after class, proclaiming, “I’ve been dying to ask you about your atheism!” Yet it never felt like an affront--she and the others were genuinely (and understandably) curious. Ralph Waldo Emerson, a forefather of modern Humanism, is often said to have written these lines: “That which dominates our imaginations and our thoughts will determine our lives and character. Therefore, it behooves us to be careful what we worship, for what we are worshiping we are becoming.